Bjarke Ingels Group and Carlo Ratti Associati have started building a 280-metre-high skyscraper in Singapore, which will feature a four-storey vertical park complete with treetop cocoons. The tower, at 88 Market Street in the city-state's financial district, will contain 29 floors of office space and 299 apartments, along with gardens spread through the building. BIG and CRA's design shows the glass and steel facade of the 51-storey tower being "pulled apart" at the base, mid and upper levels to allow trees and plants to protrude out. "At multiple elevations, the facade peels open to reveal urban oases for its users and the surrounding city – animating the elegant smoothness of modern architecture with the ubiquitous tropical nature," said BIG founder Bjarke Ingels. The tower will become the joint-second tallest building in downtown Singapore, with only SOM's Tanjong Pagar Centre rising higher. Construction of the 93,000 square metre mixed-use skyscraper, being developed by Asian real estate company CapitaLand, is already underway, following a groundbreaking ceremony on 9 February 2018. A public park will be located on the ground floor, with spaces for exercise classes, art installations and community events. Paths and covered walkways through the forest will lead to a 19-metre-high open space in the tower's podium housing shopping and dining outlets, as well as the lobbies for the offices and residences. Four interconnected levels of the tower, at the 100-metre point, will be dedicated to a 30-metre high vertical park, with a covered spiral stairway rising through the centre. This tropical garden will also feature a jungle gym, cocoons suspended in the treetops, "sky hammocks" and a cafe. "In this building, green areas are made accessible to the public at different heights, allowing the city's exuberance to extend throughout the entire tower," said Carlo Ratti, CRA's founding partner. "Working in nature will be as essential to the experience of the building as the most advanced digital technologies, offering us a glimpse of tomorrow's offices," Ratti added. Tech-wise, the Singapore Tower is due to have sensors, Internet of Things-enabled devices and artificial intelligence capabilities "scattered throughout" to allow tenants to "fully customise" the skyscraper. "Buildings can no longer be designed with a singular purpose or customer profile in mind – the definition of work is rapidly evolving and will continue to take on new forms," said CapitaLand president and CEO Lim Ming Yan. "The upcoming integrated development will set a new benchmark for workspaces of the future as we harness the best-in-class design, engineering and smart technologies to empower occupants with new levels of flexibility and mobility," he added. The lower eight floors of the tower will be occupied by 299 serviced apartments, along with a swimming pool, jogging track and gym, residents lounge, social kitchen and barbecue pits. 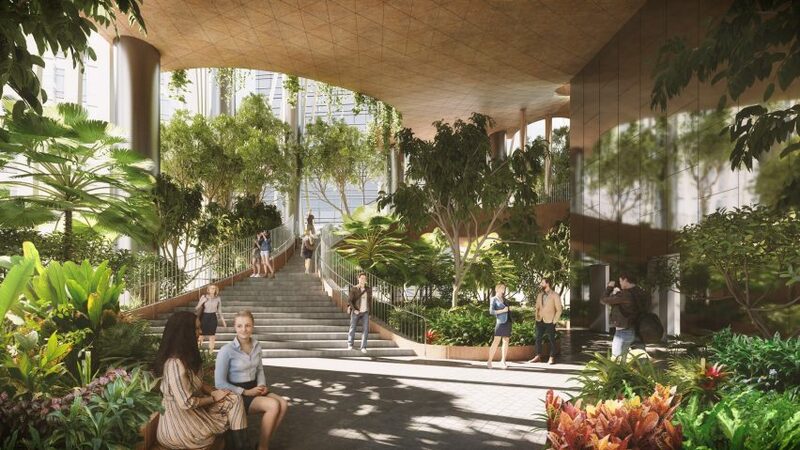 While the upper 29 floors will be office spaces, a sky terrace on the rooftop is set to feature more cascading greenery, a restaurant, and what the developers claim will be Singapore's "highest urban farm". Offices that blend high-tech with nature are becoming increasingly popular – and both BIG and CRA have worked on other projects that combine the two. Ingels' firm is currently working with Google to design the tech giant a pair of pair of office blocks topped by ramping green roofs, while other projects by Ratti's studio include a garden that uses climate-control technology to recreate the experience of all four seasons. The two firms expect to complete 88 Market Street by 2021.